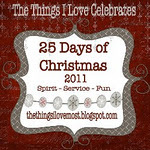 Visit our newest member Kendra from The Things I Love Most, and learn about new ways to celebrate and honor the 25 Days of Christmas. In order to help her children really understand the true spirit of Christmas she compiled a wonderful list of activities and events to do so! Then....leave a comment below about some ways that YOUR family has honored Christmas and focused on the real meaning!